← The Right height of a Table Lamp for your End Table. The number ONE RULE, when it comes to planting tomatoes, is to plant them DEEP. When you buy tomato plants, buy kind of tall ones. Take off a few rows of leaves, starting at the bottom of the plant working upwards. The now de-leaved tomato should be planted to just below where the remaining leaves start. The tomato is one of the few plants that can be planted deep without being suffocated. The de-leaved stem, once underground, will start forming roots from where the original root system started, upwards to ground level. All those extra roots will help the tomato grow and produce fruit better. Tomatoes come prepackaged in six packs (6 of the same plant grown separately in individual cells), grown 6 in one plastic box, or sold singularly. Whatever way yours comes, take them out of the containers and loosen up their root system. Take your fingers and pry them apart at the bottom. You want to get the roots growing outward, not into themselves, as they were when they grew in their cramped plastic cell homes. Now look at the illustrations. 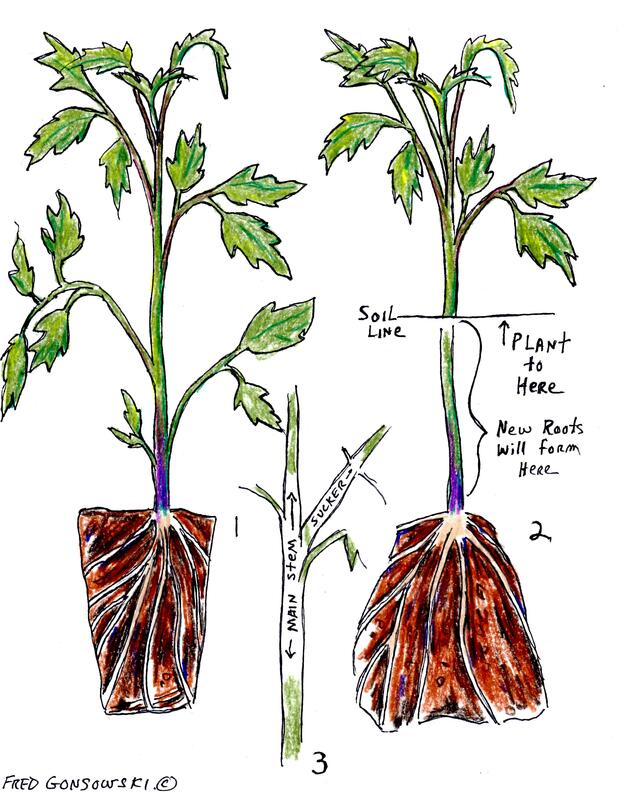 Illustration 1 shows a tomato plant, the way it looks when you buy it. Illustration 2, is the same plant showing how the root system was pulled apart to promote better root development. The tomato stem without its leaves, and the level at which it should be planted. Finally plant your tomatoes about three feet apart, in an area where they will get full sun. Full sun is 6 plus hours of direct sunlight a day. Cherry and Grape tomatoes do best growing up Sturdy Stakes (plastic coated metal stakes). I use 8 foot ones hammered into the ground. I direct their growth up the stake, tying them to the pole with jute. Take off side suckers, so there is just one straight upward growing stem. (illustration 3). Big Boy and Beef Stake tomatoes are best grown in cages. Let them do their thing, no sucker removal needed. This entry was posted in Plant Tomatoes / Raspberries, The Spring Garden. Bookmark the permalink. 8 Responses to Plant Tomatoes DEEP in Full Sun! It’s nowhere near planting time yet…but a lady’s allowed to dream. Hi there Real Life Farm Wife, my father came from a 152 acre dairy farm in upstate NY. My mother’s mother was a garden maven, so I learned a lot about planting things from both sides of the family. Grandma Gonsowski was a hard working woman, she worked as hard, or maybe harden than some men. She had to be a strong period woman, as she and grandfather worked their farm with horse pulled machinery. I have a corn planter that in the 1930’s she planted acres of fields with by hand. I remember being like 6 years old, up on a hay wagon, with Grandpa Gonsowski driving the horses through the fields toward the barn. I always had acceptable exprience growing tomatoes in the US, but here in the Philippines its a major challenge. Soil is so different. Planting deep certainly makes big sense. Don’t know if I’ll ever have tomatoes like we had back home. Thanks so much. you make it so easy for us. Thanks for a great explanation, I will share a link on my page to yours. Nice picture!